An elegant evergreen shrub, or small tree which produces 8" long white catkin-like flowers in winter. This is an excellent foundational plant or can be used as an informal hedge or screen. 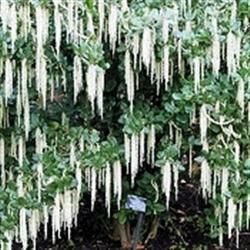 Garrya responds well to pruning and could be trained as an espalier or small tree. Height can vary rom 10' -20' depending on conditions, with a spread up to 12'.